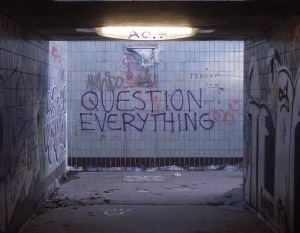 There can be many reasons why you don’t question everything. 1) Because you have always taken for granted all that is around you is true. 2) Because it is the ‘norm’. 3) Because everyone else does it, or believes it to be true. 4) Because that’s the way it’s always been. 5) Because some “authority” person, be it your parents, a teacher or professor, a doctor or a lawyer, a political figure, a minister, or the television news tells you it’s so. Did you ever stop to think that maybe, just maybe, ‘they’ were wrong? The majority of people used to believe the world was flat and only a few believed it to be round, and the minority who thought the world was round were laughed at. Or that the Earth was the center of the Universe – Galileo taught the Sun was the center of the [known] Universe. Following mounting controversy he was tried in 1633, and found “gravely suspect of heresy,” and was sentenced to indefinite imprisonment. This was subsequently commuted to house arrest, under which he remained for the rest of his life – for stating a truth. But we now know what he proposed was absolutely true.